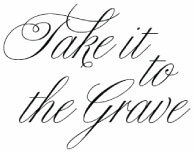 Take it to the Grave was created by Nicholas Crampton and winemaker Corey Ryan as a range of contemporary wines that explore the greatest challenges and rewards in winemaking. This starts with a Pinot Grigio from the Alpine region of Tumbarumba. The ultra-cool climate is truly winemaking on the edge but results in truly elegant wines with beautiful freshness. The Pinot Noir tackles the challenges of achieving this most demanding of varieties at an affordable price using a core of Adelaide Hills fruit. The Langhorne Creek / Barossa Valley Shiraz displays the unique richness and character that only truly old-vines can. The fun and impactful label has resonated with a wide range of consumers, each finding their own meaning in the expression “Take it to the Grave” although the outstanding wine quality, as show by gold medals and up to 92 point scores from the likes of James Halliday and Campbell Mattinson, have certainly helped get them to come back for more. Enjoy Take It To The Grave? Why not get our products delivered to your home or office? Join our mailing list for direct consumers and you'll receive updates on everything happening here at Take It To The Grave as well as exclusive clearances and promotions. Keep yourself up to date by following us on social networks, or to share with us your thoughts about Take it to the Grave.